PFF’s own Aaron Bloch reports from New York Giants practice, LT Chad Wheeler took some snaps with the first team offense today in place of LT Ereck Flowers. Wheeler was signed as an undrafted free agent in May. 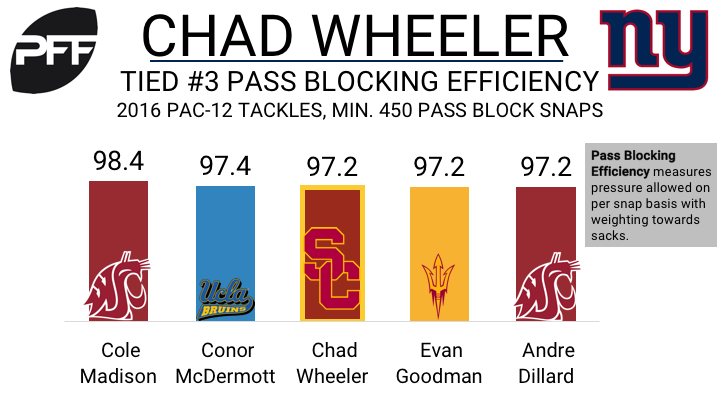 Wheeler allowed just one sack in 2016 on 492 pass blocking snaps as USC’s starting left tackle. He was just one of 13 tackles to allow one or fewer sacks on over 450 pass blocking snaps. While he is a strong pass blocker, Wheeler was much less successful with run blocking in 2016. His run blocking grade of 49.2 ranked 233rd out of 283 qualifying FBS tackles. Flowers struggled as the Giants’ left tackle last season. His overall grade of 50.2 ranked 63rd out of 77 qualifying tackles. He allowed a total of 59 pressures last season, second-most among all tackles.